Shoshana Rubli is a wife, first-time mommy, voice/dance teacher, performer, and part-time blogger at We Will Be Like Dreamers. Originally from NJ, she now resides in Jerusalem- where she and Rivki were roommates in seminary. She is happy to be sharing ‘space’ with her again! We moved this week. We found an apartment on Erev Shabbos, signed on Sunday, and the mover came for our boxes on Wednesday morning. And today is Thursday. We still don’t know where we packed the coat hangers, and I don’t have working appliances yet. Know the feeling? This was our first move since the wedding (20 months ago). So all of the packing, transitioning, and shopping for new items (like a shower curtain) brought me straight back to my headspace during our engagement. When we were engaged, I felt like I was taking a giant leap into the unknown, in so many ways. This is one of the hallmarks of engagement. Every detail was uncertain, every consultation with my ‘future husband’ over plans of our soon-to-be-shared life felt out-of-sync (this was mainly male/female, enhanced, of course, by our Swiss-American cultural difference), and I was plagued with self-doubt over how I would perfectly fulfill a role I have never attempted. This week, I saw how much I’ve grown since then. We’ve…transformed…since then. This time, moving felt good. Even in 4 days’ time. I knew that the only thing changing were our surroundings. Our actual base, our marriage, will not change (except for the better). My home is not my kitchen, my clothes, my door, my key. My home is my husband. My home is wherever we are. And there have been many tests in our shared life so far- to show us that we can withstand, care, encourage, support, and pull through for one another under all circumstances. 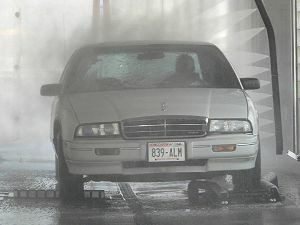 As a child, I loved drive-through car washes. I loved staring through the windshield as it was being assailed on the outside by water jets and cleaning agents. I reveled in the feeling of safety – of feeling completely protected in the midst of bombarding chaos. That is how I can describe being married to my husband. Olam Ha Ze (this world) is the place where we will earn our stripes through perseverance in the midst of trial. We can, and will, be blasted from all sides, but our car is air-tight. p.s. I still love drive-through car washes. If you know of one in the middle east, I’m all ears! Nothing much to say, just wanted to let you know that I love this post! Great analogy with the carwash! Love it. Shoshana is great! I love her blog. Great post! And I love that analogy to the car wash!